This modular system offers unlimited flexibility — you can set up a variety of configurations for displays and exhibits. Overall height of the panels is 78", with a 48" × 66" display area. The panel frame consists of 7/8" square steel tubing, welded together to form a sturdy, one-piece unit, and finished with a gray powder-coated finish. Each panel includes black glides to protect floors and a set of straight, 90° and 120° connecting brackets so that adjacent panels can be attached in a variety of angles. 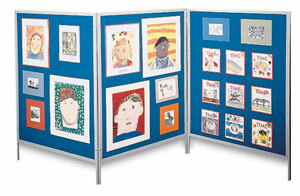 Or, use free-standing panels with Display Panel Feet (sold separately). Choose from 2 functional surfaces — Gray Vinyl or Loop Fabric. FOB factory. Hook Tab Circles — For use with the Loop Fabric Surface. This package includes 200 tab circles. Each circle measures 5/8" (15 mm). Loop Fabric Surface — The 100% nylon loop fabric is a highly attractive and versatile display panel surface. Simply attach Hook Tab Circles to the back of your display items and press into position on the loop fabric surface. Your item is securely displayed, yet can be easily removed and repositioned. The fabric is laminated to both sides of a 1/4" thick tackboard. Available in Blue or Silver. Display Panel Feet — These feet are T-shaped, with the legs of a panel fitting into the vertical section of the feet. They're finished in gray to match the panel frames, with snap-locks for a secure hold. Each foot has two adjustable nylon glides to protect your floors. Sold by the pair. Use one pair of feet per panel. FOB Factory. Gray Vinyl-Covered Surface — This durable, burlap-textured surface retains its rich-looking appearance through years of hard use. It overlays 1/4" thick tackboard and is an ideal display surface for lightweight items, which can be attached with thumbtacks, push-pins, or staples. 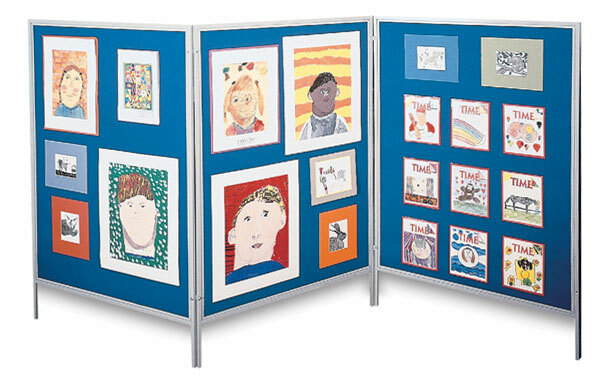 Display unframed prints, posters, brochures, signs, photos and more.